Originally from Millinocket, Jim moved to Auburn in the 8th grade. He graduated from Edward Little High School in 1972 and from Bates College with a Biology degree in 1976. Jim took his first stained glass class from his friend (and former partner) Nel Bernard at Craftschool in Lewiston in 1977. Jim worked at Central Maine Medical Center for over 25 years. Starting as a dishwasher in 1972 while attending Bates, he cooked in Food Service, ran the print shop and mailroom, supervised in the purchasing / materials management department and finally was the Director of the Annual Fund (a corporate fundraiser for Central Maine Healthcare). Tired of wearing a suit to work each day, Jim left CMMC in 1998 to pursue his passion and become a starving stained glass artist, partnering with his mentor Nel in 1999. 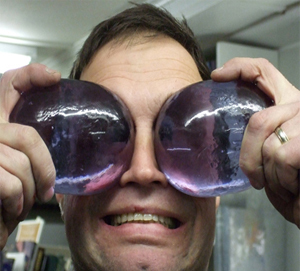 In March of 2010, Jim bought out his partners Nel and Denise and is now the sole owner of Maine Art Glass. Jim now has over 30 years experience working in stained glass. He has completed numerous small to large commissions for individuals and businesses. He has restored dozens of church windows. He has shown and sold his works at many craft shows and galleries but now concentrates on keeping the Maine Art Glass Galleries filled with his original art. Jim has furthered his glass experience by taking various courses. Slumping and fusing glass at Maine College of Art. Jim is a natural teacher. He loves to share his enthusiasm in glass and art with his students. He has been teaching stained glass off and on for over 20 years. He has taught hundreds of beginners the basics of stained glass, copper foil and lead came, fused and slumped glass, sandblasting, mosaics, restoration and design. Currently, in addition to all the classes he teaches here at Maine Art Glass he teaches the adult education classes at Edward Little High School in Auburn. Jim’s biology background is very evident in his art. Many of his original works depict wildlife and nature. As a biologist his art tends to be realistic and accurate. 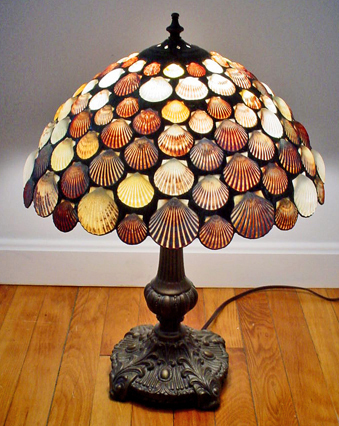 Jim also incorporates seashells into many designs, windows and lampshades he creates. Jim is the consummate collector. He has spent a lifetime collecting natural artifacts, sea shells, fossils, rocks and minerals, skulls, feathers, and taxidermy. Jim has also provided Maine Art Glass with his extensive library of books on natural history and reference materials which provides an unlimited supply of design inspiration and ideas. His CD collection (8000+) provides the constant background music that you encounter when taking classes or visiting Maine Art Glass. 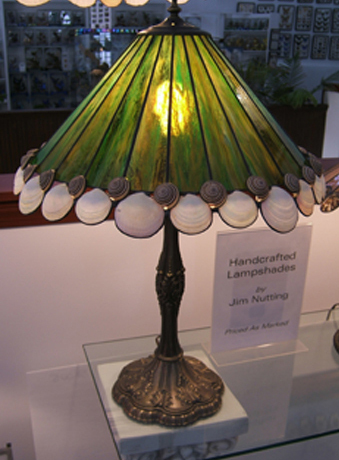 When you visit Maine Art Glass, you will encounter the most extensive and unusual of Jim’s collections. Up in the mezzanine (in the former choir loft of the church) and scattered throughout the galleries of Maine Art Glass, Jim has put together a world class display of tropical and local butterflies and insects, all stunningly displayed in stained glass display cases and hand made shadow boxes. This collection, known as The Butterfly and Insect Museum at Maine Art Glass is becoming well known throughout Maine and across the country. The Butterfly and Insect Museum is becoming a destination for many school groups, summer camps, scout groups, youth and adult service organizations and families. 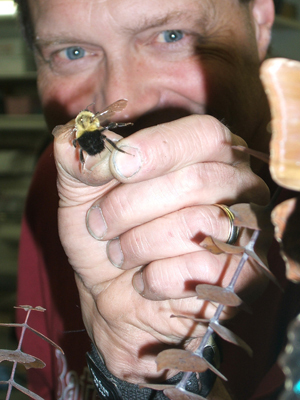 Jim can be scheduled to provide group tours, talks on insects and also live demonstrations of insects and arachnids. Jim is one of the few individuals in Maine licensed by the Maine Inland Fish and Wildlife Dept. to keep and exhibit live tarantulas, scorpions and other exotic invertebrates. Jim is very proud of his daughter, Rachel who has been working with him at Maine Art Glass for the last 5-6 years and has become quite a fine glass artist herself.